Danielle Butler with the goat skeleton she built this summer. 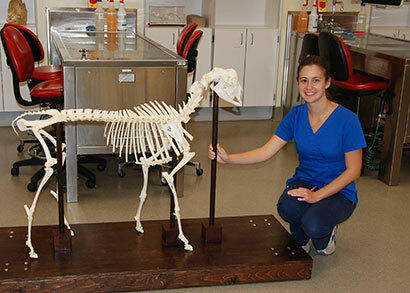 Dr. Terri Clark’s mission to populate the CVM anatomy lab with every skeleton in the animal kingdom is one step closer to completion thanks to second-year student Danielle Butler. She spent most of the summer articulating a goat skeleton. Although interested in both lab animal medicine and radiology, Butler isn’t sure yet which career path she will choose. “It’s a little overwhelming. There are so many different things I can do, it’s hard to just pick one and go for it. I’m not there yet.” Fortunately, she has three more years to decide.